It comes with a bad reputation but there are a few things to do in Belize City – but find out why it’s worth a quick stop as you transit through the country. Characters from all walks of life, poverty & crime… it’s this mixture that makes Belize City the biggest & baddest of all the destinations in Belize – and the title isn’t completely undeserved. But alongside the rundown streets, uneven pavements & grimy canals, in Belize City you can also find colonial mansions, stately churches & seaside parks. 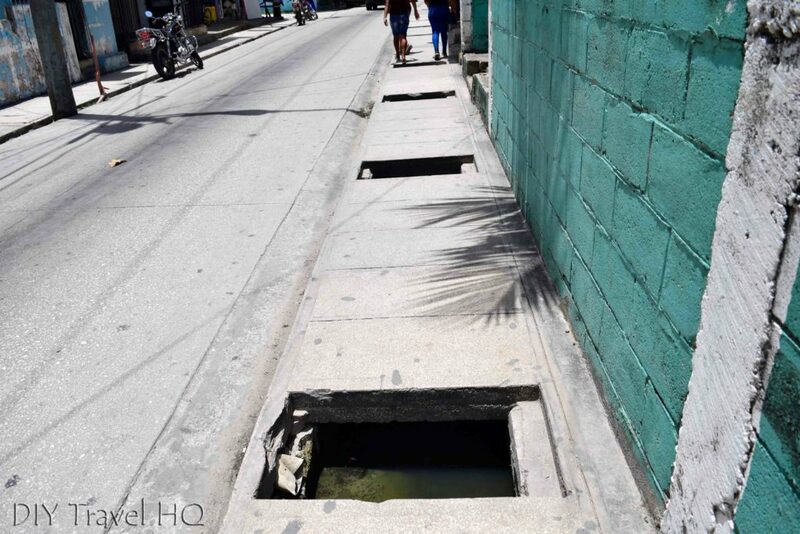 Watch your step in Belize City! There’s also a certain energy & desperation in the air, starkly different from the easy-going nature that characterizes Belize & its people. Belize City is notorious for its hustlers preying on tourists, so be extra careful with your valuables. We here at DIY Travel HQ caught a morning ferry to Belize City from Caye Caulker, with 2 hours to kill before our bus to the Community Baboon Sanctuary. So we took turns waiting with our backpacks in the ferry terminal hall, while the other person went sightseeing around town. The ferry terminal hall had a DJ & the music was loud! Belize City is divided in half by the Swing Bridge over Haulover Creek, a tributary of the Belize River. North of the bridge is the slightly more upscale part of the city. South of the Swing Bridge is the commercial zone, with banks, stores & souvenir shops along Albert Street. It’s a compact centre & everything of interest is within walking distance. In fact, it’s best not to stray too far from the main sights, especially at night, as safety is an issue around the fringes of the city. Guesthouses, hotels & restaurants can be found on both sides of the creek but budget accommodation is hard to come by. In less than 2 hours, Erik & I had two completely different impressions of Belize City, on our separate tours of the city. Erik couldn’t walk anywhere without being harassed. On the other hand, I found it safe enough & had no hassles or attention from anyone. Either way, in my opinion, if you have a couple of hours (or more) to spare as you’re going to/from Caye Caulker or the airport, Belize City is definitely worth a visit. The Swing Bridge was made in Liverpool, England & is the only manually operated type of its kind left in the Americas although these days, it’s rarely operated. The Swing Bridge is still a key landmark of Belize City & the best spot from which to people-watch – entire cross-sections of Belizean society cross the bridge every day. The Court House was built in 1926 to serve administrative & judicial functions during the colonial era. It’s still used for similar purposes today. In front of the Court House is a small square with a fountain in the middle, known as Battlefield Park. St John’s Cathedral is made from red bricks brought from Britain, using slave labour from 1812 to 1820. It’s the oldest Anglican church in Central America. This Memorial Park on the seafront pays tribute to the Belizeans who died in the world wars. Baron Bliss was a wealthy, eccentric Englishman who died on his yacht on route to Belize in 1869. Despite never setting food on Belizean land, he left most of his fortune to the colony & was buried in Belize City. There are many plaques, in gratitude, with his name across the country & March 9, the day of his death, is even known as Baron Bliss Day. Baron Bliss’ granite tomb is located next to a lighthouse (both built with funds from his estate), on Fort George peninsula. The Museum of Belize chronicles the story of the country, from colonialisation to independence. It’s housed in a former jail – you can see one of the cells that has been preserved. The museum also displays an impressive collection of Mayan artifacts as well as historical documents & photographs. All roads in Belize lead to & from Belize City – you’ll have no trouble with transport. Did you enjoy reading Things to do in Belize City in 2 Hours? What do you think of Belize City – love it or hate it?